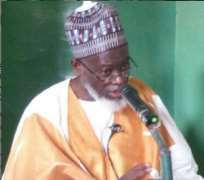 A prominent Tijjaniyya sect’s cleric in Kaduna State, Sheik Tijjani Khalifa is dead. According to the News Agency of Nigeria (NAN), Sheik Sani Khalifa, a younger brother to the deceased who confirmed the death, said the cleric died at the age of 73 after a brief illness. The late Khalifa was a member of the Broad of Trustees (BOT) of the national body of Munazzamatul Fityanul Islam. Sani said his brother died on Wednesday night at his residence in Zaria, and had left behind four wives and 32 children.